The weather threatened rain on a Saturday in May when a special surprise was in store for a fellow who is 95 years old. Everyone who shared in the surprise hoped the weather would cooperate so that Mr. Roy Harvey of the Taylors Crossroads community could sit behind a team of mules once again. That was the surprise... a ride in a wagon being pulled by a team of mules. Neighbors, friends and family members gathered at the home of Mr. Harvey’s daughter and son-in-law, Bea and Ray Taylor, on the Keisling Ridge Road awaiting the arrival of a wagon and mules owned and driven by Kenneth Sells. 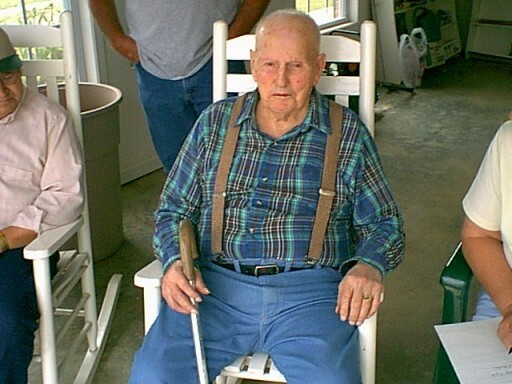 Everyone present, with the exception of Mr. Harvey, knew about the surprise, and as the wagon came down the driveway to the Taylor home, Ray Taylor asked his father-in-law what he thought about taking a ride in the wagon. His immediate response was "I’m ready!" Because of failing eyesight, images aren’t easily seen for Mr. Harvey, but the excitement was easy to see in his eyes once he realized what he was going to get to do. With the help of a couple of able-bodied neighbors, Mr. Harvey was lifted into a seat beside Kenneth Sells, and along with Rod Johnson, the trio set off. The idea to take Mr. Harvey for a ride began with Rod and Kenneth, and as a result of their idea, a surprise with family, neighbors, and friends sharing in the day was planned. The wagon that carried the fellows on their journey wasn’t just any old ordinary wagon either. Mr. Harvey’s ride deserved the finest one that could be found, and that’s just what it was. Kenneth Sells hand-crafted the wagon himself, beginning with the cutting of cedar trees from his property. Next, he hand-planed the lumber at his sawmill. And finally, after many long hours, the project was painstakingly completed. 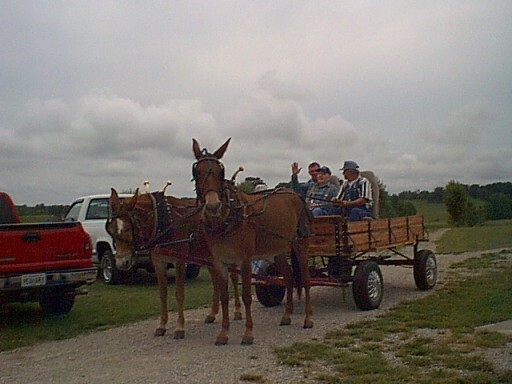 Kenneth’s mules that pulled the wagon are named Ruth and Jen. But this was not the only team of mules that showed up at the Taylor house that day. Rod Johnson’s son, Brian, came with his mules, Jake and Hank. Donald Mabe, and his mule named Jackson was next, followed by Frankie Beason with Troy, Pride, and Homer in tow. The entire group of wagons formed a parade as Kenneth, Rod and Mr. Harvey led the way to the old Plain Grove school (Possum Trot), a distance of around a half a mile from the Taylor home. Mr. Roy Harvey, Kenneth Sells and Rod Johnson start out for a wagon ride. Sitting behind a team of mules wasn’t anything new to Mr. Harvey. He told me he owned a lot of good mules over the years. He said the best ones he owned were named Ole Red and Bill. A wagon served as transportation for his family for many years since Mr. Harvey didn’t own a vehicle until sometime in the 1950's. The Herd Ridge community was the place he grew up as one of seven children of Tom and Byrd Harvey. He said life was hard back then, but he thought he had a pretty good life. He could remember hauling lumber on a wagon to Livingston for $5.00 a load, and that a good saddle mule could be bought for $300.00 back then. Today I’m told they can bring as much as $4,000 to $8,000.00 each. Mr. Roy Harvey, Kenneth Sells and Rod Johnson return from their ride to the old Plain Grove (Possum Trot) school building. Mr. Harvey, whose wife, Ida (Richardson) Harvey passed away seven years ago, had five sons and one daughter. Their names are Douglas; Dudley; Donald; Jay; Gerald; and Beatrice. He shares the home of his daughter, Bea and her husband, Ray Taylor. Mr. Harvey’s eyesight may not be as good as it used to be, but his mind is as sharp as ever. He recited a poem for me that afternoon, something he learned when he was in the third grade at Herd School. The poem was titled "A Wonderful World" and he told me his teacher’s name that year was Bessie Parrott. Family members present for this special event, including Bea and Ray Taylor, were Douglas Harvey, his daughter, Teresa Barber and her fiancee, Kenny Craig; Donald Harvey and wife, Sue Harvey, their daughter, Tammy Long and her son, Caleb; Julie and James Brown, and their daughters, Lindsey and Kesley. A number of neighbors and friends were also in attendance. Being a good neighbor is something very much alive and well in the Taylors Crossroads community. 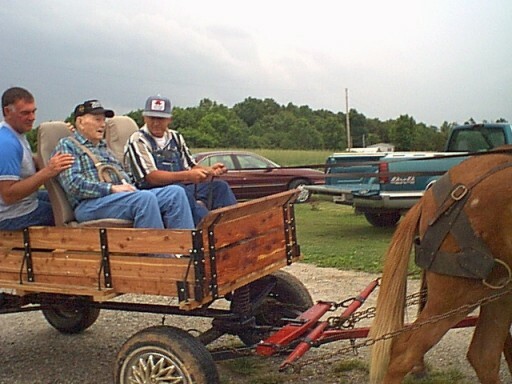 Thanks to Kenneth and Rod, Mr. Harvey was able to enjoy once more a ride through the countryside behind a team of mules, something he has spent a lot of time doing in the past. Had the weather not had rain in the forecast, the trip was to have included going to his old home place on the Herd Ridge, but that journey has been saved for the next time. And with the kindness of caring neighbors like Kenneth and Rod, I’ll just bet they do their best to make certain that trip takes place. Something as simple as a wagon ride brought much happiness not only to Mr. Harvey, but to everyone who was there. It also served as a reminder that in our busy lives, it’s always the simple things that mean the most, and a person had to only look at the big smile of Mr. Harvey’s face and the sparkle in his eyes to see how very true that is. I was glad to share in this special day for Mr. Harvey.